I've never been a fan of anything that's bitter; that's one taste sensation I can't quite tolerate. Knowing this, I've stayed away from Bittergourds all my life. Bitter gourds are often considered a vegetable when actually they are fruits and the most bitter of them all. Used widely in Indian cooking, Bitter gourds are known for their medicinal properties. Due to its extremely bitter taste, cooking with bitter gourd is an art and the right techniques have to be incorporated. My Mother-in-law recently taught me how to cook with Bitter gourd, and boy, I must say I regret not having learned this sooner. Trim the ends of the gourds, slit in half and remove the white soft innards and seeds.Chop the gourds into tiny pieces, should have about a cup. Transfer to bowl, add salt and turmeric. Toss well and allow to sit overnight. This process releases the bitter juices. This is an important step to make the gourd edible. Rinse chopped gourds thoroughly 3-4 times and drain.Squeeze tamarind juice, remove pith and seeds, reserve. Heat oil in a pan, add the mustard seeds and when it begins to splutter add the curry leaves and onions. Saute till onions are soft and then add the chopped gourd. Saute for a minute. Add the tamarind juice, jaggery, red chilli powder and salt as required. Cover and cook on medium heat for 5-6 minutes, until the gourd is cooked through.Add water if required.Also add the sesame seed powder and combine well. Simmer for a minute and then turn off heat. 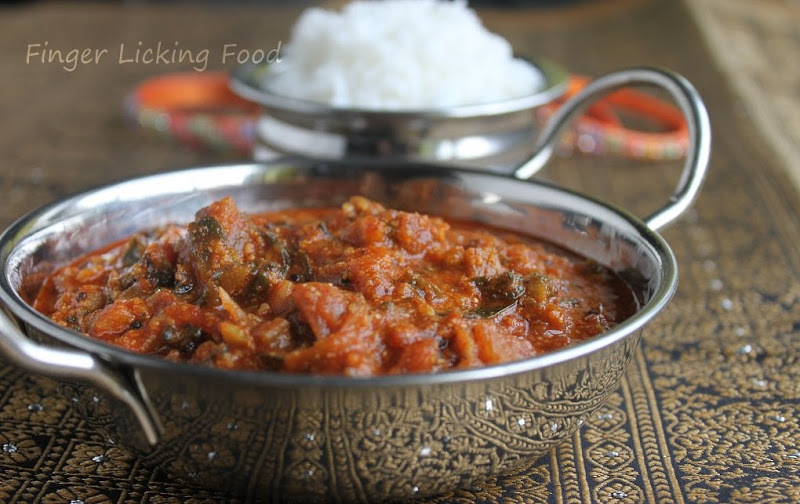 This curry goes well with hot rice and ghee. Hope you enjoy this curry as much as I did. 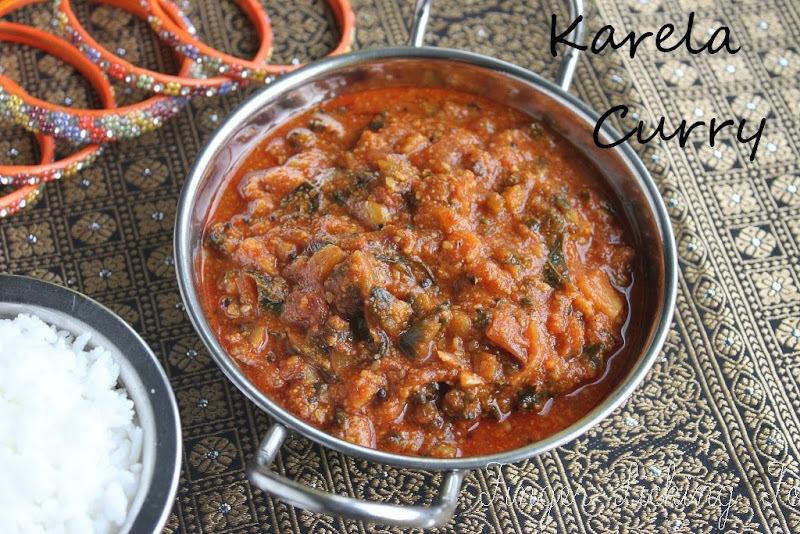 I was not a big fan of karela but these days I've started having them and this curry looks yumm!!! 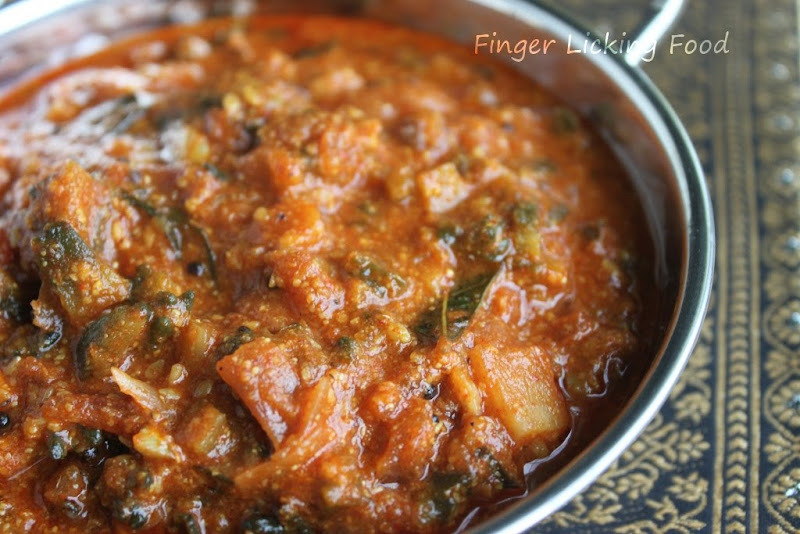 Delicious and spicy curry..love spicy bittergourd,will surely try this. This is a very interesting recipe. What does a bittergourd look like? Do you have a picture? You have a nice blog. I liked this karela curry. Is this good for people with diabetes? I'm definitely going to try it. Thanks for sharing. How much tamarind is that? TT ball sized - Table tennis ball size of tamarind soaked in water yields about a 1/4 cup of pulp. Great Blog!! Karela is really good for health. Your thought processing is wonderful. The way you tell the thing is awesome.